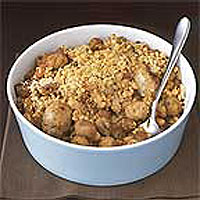 The authentic cassoulet from Languedoc is a Sunday dish that includes duck, lamb and pork and takes eight hours to prepare. On Monday, however, the leftovers are mixed with chestnuts and the resulting dish is ready to eat in only an hour. For a vegetarian version, replace the meat with sautéed mushrooms. Put the tomato, onion and half the garlic in a liquidiser and process to a purée. Heat 1 tbsp oil in a frying pan, add the purée and boil for 2-3 minutes until thick. Stir in the beans, and add either the liquid from the cans, or the vegetable stock if you prefer. Add the chestnuts, paprika and bay leaf. Bring to the boil, reduce the heat and cook gently for 10 minutes. Meanwhile, heat another 1 tbsp oil in a frying pan, add the prosciutto or bacon, and sausages, sprinkle with the thyme, the remaining garlic and lots of pepper. Stir over the heat for about 10 minutes until everything is cooked through and browned a little. Remove and reserve. Put the frying pan back on a medium-high heat with 3 tbsp oil. When hot, stir in the breadcrumbs. Fry until golden, stirring so they don't burn. Spread half the beans in a casserole, top with the ham mixture and sausages, sprinkle with a layer of breadcrumbs, cover with the remaining beans and finish with breadcrumbs. Bake for about 20 minutes until the crumbs have formed a crisp crust. Serve hot.